and described so clearly or so beautifully the business of the monastic life. The invitation to Stanley Roseman to draw at the Benedictine Abbey of Subiaco in December 1978 was of great historic significance in bringing to a close the artist's first year of his work on the monastic life. The Abbey of Subiaco, situated in a mountain valley in the Latium region of central Italy, was founded in the sixth century by Benedict of Nursia, (c.480-c.547), the saintly Italian abbot whose rule known as the Rule of St. Benedict is the basis for monastic observance in the Western Church. "St. Benedict's Rule urges the monk to rush forward in his spiritual quest, but the Rule also provides for those who proceed more slowly or hesitatingly on the interior journey that is the monastic life." Written account relates that Benedict, as a young man in search of a contemplative life, made his way to an isolated place called Subiaco, in the Sabine Hills, where he lived for three years in solitude in a cave, since called Sacro Speco, or Holy Grotto. At Subiaco, Benedict established twelve monastic communities, each of which numbered twelve monks, with an abbot as their superior. 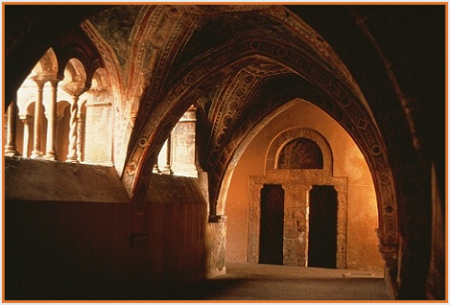 Over time, there evolved one monastery, the large monastic complex that exists today. Benedict's reputation as an ascetic, holy man spread throughout the region. Many people came to him for spiritual guidance, and he gained followers who wanted to share in the contemplative life. "The important monastic principles of 'Obedience,' 'Silence,' and 'Humility' addressed in following chapters reconfirm ancient ascetic practices inherent to monastic life. . . .
"Benedict takes into consideration the sick and infirm, as well as those engaged in heavy, physical labor, by augmenting for them the measure of food and drink. The Rule specifies that members of the community who are in poor health or not physically strong be assigned work sufficient to keep them occupied but not so strenuous as to be detrimental to their health. And Benedict instructs the monks to be responsible and compassionate in taking care of their sick and elderly brethren. "Chapter 4, 'The Instruments of Good Works,' lists a series of commandments derived from the Scriptures and observances pertaining to the monastic life. The list mentions ascetic practices of self-denial and fasting; acts of charity to relieve the poor, visit the sick, help the troubled, and console the sorrowful; as well as to shun worldly behavior, keep mindful daily of one's own mortality, keep constant guard over the actions of one's life, and devote oneself to prayer. "In the Epilogue, Chapter 73, Benedict counsels the monk to be guided by the Holy Scriptures, the Lives of the Fathers, the Rule of the fourth-century monk and leading churchman St. Basil, and the Institutes and Conferences of the fifth-century monk John Cassian, who brought the teachings of the Desert Fathers to Gaul and adapted them to a Western monastic context. Although Benedict compiled his Rule for contemplatives living in community, he also encourages those inclined to live in solitude. 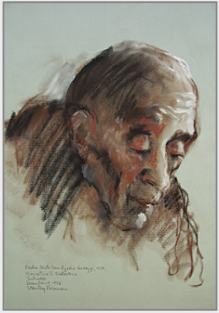 At the Abbey of Subiaco, Roseman was invited to draw Abbot Emeritus Don Egidio Gavazzi, whose beautiful and deeply felt portrait is presented at the top of the page and below, (fig. 3). The Abbot, from a prominent family in Lombardy, had been an engineer whose calling to the monastic life brought him to Subiaco. He became Coadjutor Abbot in 1951 and Abbot the following year. He was a Councillor Father at the Second Vatican Council, and with first-hand knowledge he guided the community of Benedictine monks at Subiaco during the historic changes resulting from Vatican II. Abbot Egidio retired in 1974 at the age of 70, revered as a holy man. "Although the monastic, or contemplative, life is a life apart from the world - a cloistered life behind the monastery walls - cenobitism refers to living in a monastic community. Therefore a monk's cell is his retreat, a place in the communal life of the monastery where, as the etymology of the word 'monk' suggests, he can be 'alone' or 'apart from.' The invitation from Abbot Egidio Gavazzi to draw him in his cell was of great significance. "Abbot Egidio welcomed me with kind words, a friendly smile, and a gentle hand on my shoulder as he brought me into his room. He thoughtfully placed a chair for me to sit by his side. The Abbot's gracious reception and the rapport he quickly established communicated his warm feelings towards me and his encouragement of my work on the monastic life. "The observance of the Divine Office during the night and day is discussed in Chapters 8 to 20, which specify the order and number of the Psalms and emphasize reverence at prayer. . . .
"The Abbot opened his breviary and read and prayed in silence, and I took up my paper and chalks and began drawing. . . ."
With a painterly use of the chalks and chiaroscuro modeling of light and shade, Roseman has beautifully rendered the face of Don Egidio and conveys a spiritual intensity in this deeply felt portrait of the Abbot of Subiaco. (London: Darton, Longman &Todd, 1980). 1. The single extent source for information on the life of St. Benedict is the Dialogues of Pope Gregory the Great. with additional references in Book III and IV to the founder of the Abbey of Subiaco. Psalms 9 and 10 as well as Psalms 114 and 115, while separating into two parts each Psalm 116 and Psalm 148.
are Psalms 51 and 67 in the Hebrew Psalter.